Each year, 15-20 grants of $10,000 each will be awarded in these two locations. The focus of Reed´s new foundation are small charities that benefit children and animals. These generous grants will make significant differences in meeting organizational expenses and/or funding special projects. Future plans for the Richard R. Reed Foundation include scholarship awards for winning essays on the topics of research in science and reason. 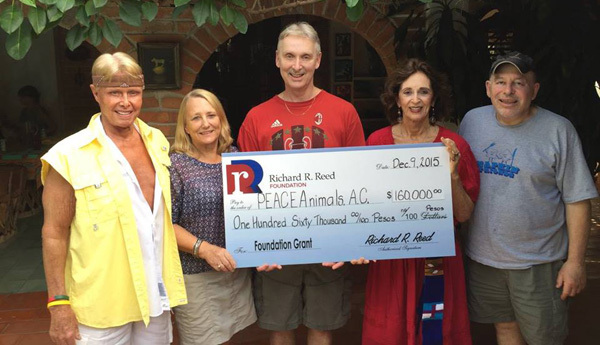 One of the charities Richard selected as a recipient of a 160,000 peso grant is PEACEAnimals, a free mobile spay/neuter program operating primarily in the area of Puerto Vallarta. The mission of PEACEAnimals is to reduce the suffering of animals. The overpopulation of cats and dogs results in their starvation, disease, vehicular injuries, often resulting in death, abandonment, abuse and the decimation of wildlife. Operating approximately 36 surgery weeks (Wednesday-Saturday) a year, more than 4,000 cats and dogs are sterilized annually. Cost per surgery week is approximately $1,800 USD. The Richard R. Reed Foundation grant of approximately $10,000 USD at the current peso/dollar exchange rate will result in the sterilization of approximately 550 cats and dogs, which makes a serious impact on the unwanted pet situation. Corazon de Niña, a shelter for girls and boys from the ages of two to twenty; LADRA, a rescued dog sanctuary and adoption center; Pasitos de Luz, a daily care for handicapped children; and Down Syndrome Kids Center (Asociación Down) that will help them continue to provide free programs for those children from poor families that cannot afford treatments to help these children lead healthy and productive lives. In addition to his consuming work as director of the new Richard R. Reed Foundation, Reed is the very active CEO of ASF Payment Solutions, which he founded, and a very active member of the American Taekwondo Assocation, which he co-founded. Incidentally, Richard is the proud owner of his Black Belt status. Serving as President of the Richard R. Reed Foundation is Richard´s daughter, Tamara Reed-Valdez. For more information, visit the Richard R. Reed Foundation. More photographs are available on the Richard R. Reed Foundation page on FaceBook. For additional information on PEACEAnimals email gretchen@peaceanimals.org or visit PEACEAnimals.